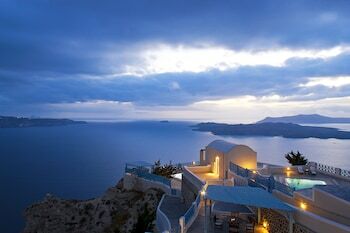 Perched on the lip of a volcanic crater, Santorini is beautiful, romantic and mysterious. Here you will enjoy the most stunning sunsets, unique beaches and unforgettable views. 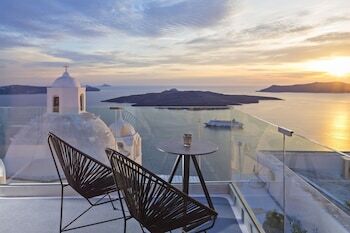 Santorini consists of a group of 5 islands, Thira being the most popular and 4 smaller ones spread around the volcano which erupted in 1650 B.C. It can be said that this island has two parts to it. The caldera side (up to 300 m peak overlooking the volcano) and the low part of the island where most of the beaches can be found. There are numerous traditional houses, hotels and villas literally built against the rock which enjoy unforgettable views across the sea making Santorini such a unique island. If you stay at Fira it is recommended that you visit the archaeological museum containing sculptures, vases and clay figurines from the Archaic, Hellenistic and Roman periods. There is a large choice of volcanic black sand beaches around the island. The most popular ones are Kamari and Perissa beach with numerous tavernas, cafes and bars. More attractions. 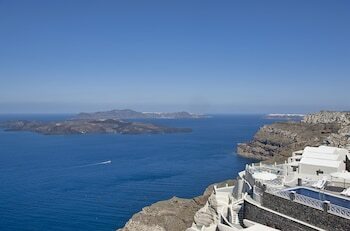 Santorini is actually a small archipelago and was originally a single island until an enormous volcanic eruption, the Minoan eruption, in 1628 BC flooded the edge of the caldera and turned it into an archipelago. In 1967, an almost perfectly preserved Bronze Age city was discovered under meters of ash layers that remained from the eruption. Santorini is home is the famously beautiful ‘red beach’ which attracts many visitors with its slabs of black and red volcanic rock.